Not to be confused with Cudge. Kudgel is a large, muscular, club-wielding Kremling and a boss in the game Donkey Kong Country 2: Diddy's Kong Quest. His name is derived from "cudgel," meaning "club" or "to beat with a club." Kudgel is the boss of the third area of Crocodile Isle, Krem Quay. Kudgel is fought in the level "Kudgel's Kontest." Kudgel attacks Diddy Kong and Dixie Kong by leaping through the air and trying to smash down on them; his landings (which make shockwaves in the GBA version) will also stun the Kongs if they are not in midair. Kudgel first attacks by leaping off-screen and landing where the Kongs are. After three such jumps, Kudgel will land and swing his club. He then performs a short jump that causes a TNT Barrel to appear. The TNT Barrel must be thrown at Kudgel quickly or he will jump away; if the Kongs try to throw the TNT Barrel at Kudgel after he jumps away, or get too close while carrying the TNT Barrel, he'll block the TNT Barrel with his club. Kudgel will speed up each time he gets hit by a TNT Barrel. After being hit by three TNT Barrels, Kudgel will instead jump in an arc to stomp the Kongs. These jumps are followed by a short jump that causes another TNT Barrel to appear. Every time Kudgel is hit with a TNT Barrel, he will jump increasingly lower and faster. After being hit by six TNT Barrels, Kudgel will be blasted into Krem Quay's swamp water. Kudgel is the only boss from Donkey Kong Country 2 who does not reappear in Donkey Kong Land 2. Gurabba Glubba; note that he is the only Kremling whose name does not start with a "K sound" in Japanese editions. Kudgel's SNES sprites show him wearing yellow pants instead of the red ones depicted in his official art. This was corrected in the GBA remake. 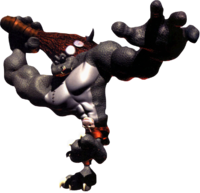 Kudgel's scream in the original game is Klobber's scream slowed down and lower-pitched, while his voice in the Game Boy Advance version is Chunky Kong's voice recycled. This page was last edited on February 19, 2019, at 02:52.